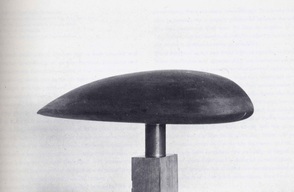 Paul Jaray (1889–1974): 'Ideal streamlined form for a body close to the ground', c. 1920, model. Tatra T600 Tatraplan matches Jaray's ideal form the closest of any other serially produced automobile. 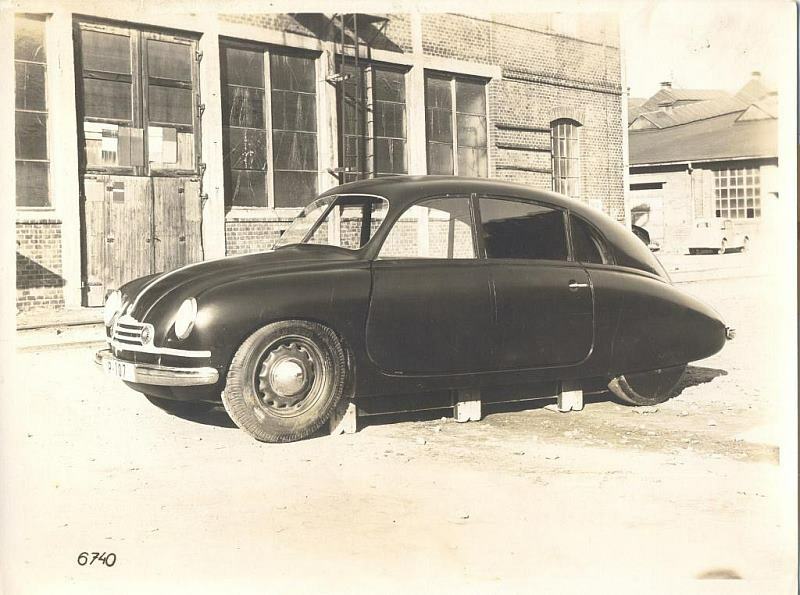 First Tatra T107 'Ambrož' prototype mock-up, December 1946. 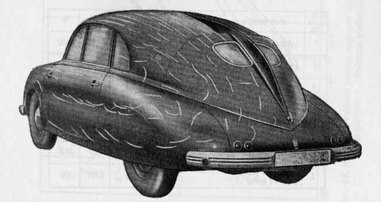 Further full-size mock-up study of Tatra T107 prototype, early 1947. 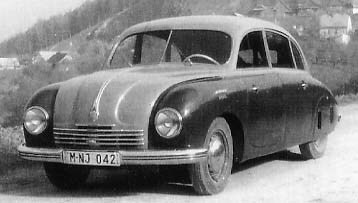 Second Tatra T107 'Josef' prototype, March 1947. 'Josef' prototype with the final T2–107 mock-up and prototype, and T97, 1947. 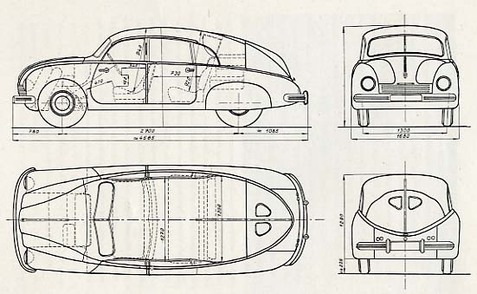 The front of the 1947 T2–107 body to the post between the front and rear doors was designed by František Kardaus of Studio Burjanek a Remo (B a R), the first industrial designer involved with Tatra car bodies proposals. First introduced at Prague Autosalon, 18-28 October, 1947. 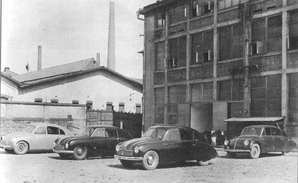 The car was initially named 'Autoplan' then Kardaus, it is claimed, named it 'Tatraplan', the name registered on 11 December 1947. T2–107 Tatraplan 1947 (T2–107, type designation changed to T600 [T=Type 600] at the end of 1947). 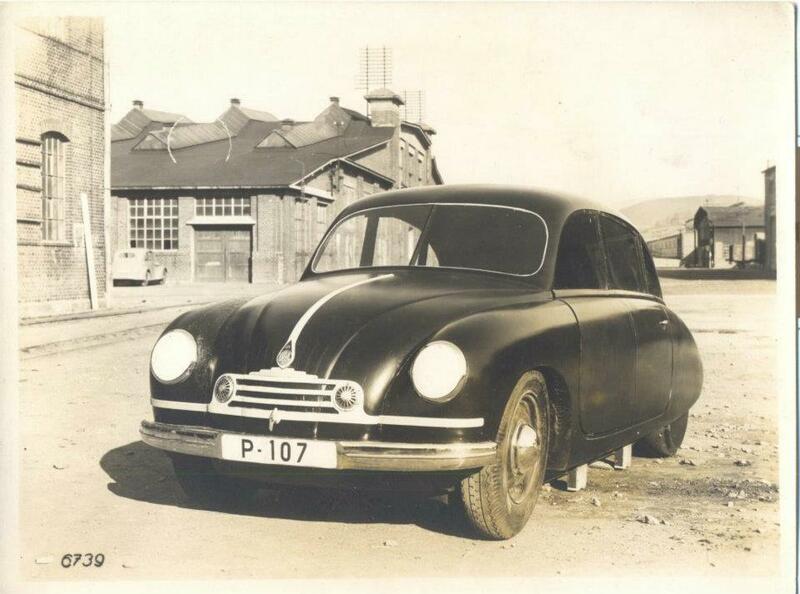 Serial manufacture: 1948–1951 in Tatra, Kopřivnice, 1951–1952 in Škoda, Mladá Boleslav. Number made including 2 (T107) + 5 (T2-107) prototypes: 6342 (4242 in Kopřivnice, 2100 in Mladá Boleslav). Austria: 435, China: 200, West Germany: 195, Sweden: 184 (LHD only), Finland: 248, Canada: 168, Belgium: 167, Switzerland: 153, Hungary: 146, USSR: 126, Poland: 97, Yugoslavia: 76, The Netherlands: 60, East Germany: 46, Egypt: 45, Morocco: 29, Albania: 20, Romania: 17, Portugal: 1, Australia (RHD): tbc, Indonesia (RHD): tbc, Ceylon (RHD): tbc, Pakistan (RHD): tbc, Malaya (RHD): tbc, Kenya (RHD): tbc, Cyprus (RHD): tbc, Ethiopia (RHD): tbc, South Africa (RHD): tbc, Sudan: tbc, Argentina: tbc. Special exports for use by Czechoslovak and East block embassies: tbc. First series manufacture started on 24 June 1948.
soon increasing to 140,000 Czechoslovak crowns (approx £1,000 / US $2800). T107 two units: 70.020 – 70.021, each with a 1729 cc 80 x 86 with an axial fan on vertical shaft, one carburettor engine, T2-107 five units: 70.022 – 70.026 each with a 1952 cc 85 x 86 with an axial fan on vertical shaft, one carburettor engine. First series body numbers: 70.027 – 70.876, subsequent series: 70.877 – 76.867 (Kopřivnice, 1948: 90, 1949: 1506, 1950: 2025, 1951: 614 units) [70.877 – 70.926, 71.029 – 71.032, 71.035, 71.037 – 71.044, 71.047 – 71.055, 71.060 – 71.070, 71.072 – 71.082, 71.086 – 72.281, 74.730 – 75.126, – 76.867], officially the last car was produced there on 25 May, 1951 although some units might have been made there up to October 1951 such as 76.411 and 76.408 (some numbers were used out of chronological sequence). 25th to 29th series (Škoda numbered series): 179.001 – 181.100 (Mladá Boleslav, 1951: 236, 1952: 1,864 units) from August 1951 to May 1952. 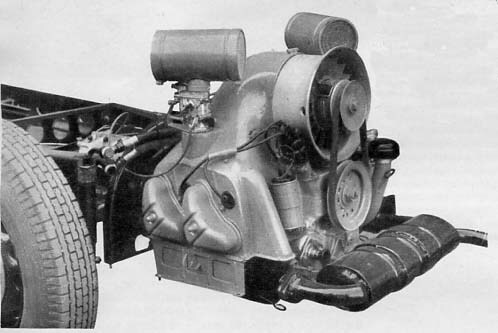 First series 70.027 – 70.876 engine numbers: 600.1.85.48 to 600.853.85.49 had a 1952 cc 85 mm bore, 86 mm stroke flat four engine with an axial fan on vertical shaft and one carburettor; from body number 70.877 engine numbers 600.854.85.49 to 600.5103.85.51 had an engine with a fan on horizontal shaft and two carburettors. The manufacturing label stated: 'Tatra, národní podnik, závod Kopřivnice'. Škoda Mladá Boleslav manufacture series 179.001 – 181.100 had the latter engines with the same engine numbers as the body numbers and the manufacturing label stated: 'Automobilové závody, národní podnik, závod Mladá Boleslav - ČSR'. 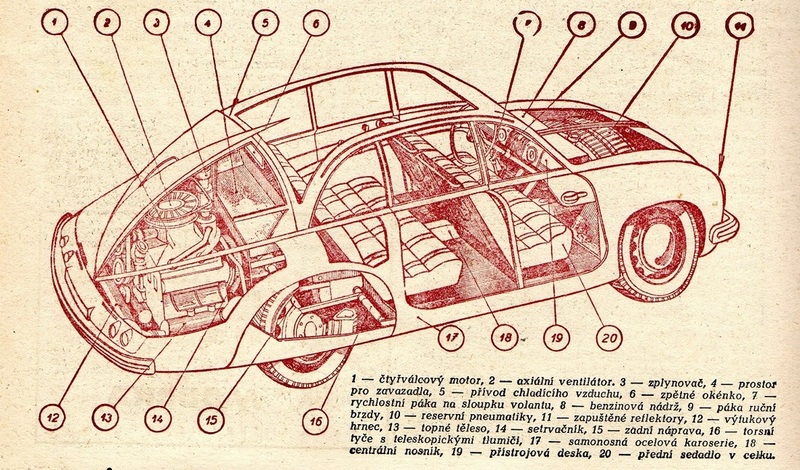 Engine number explained: first number: Tatra type, second number: engine number, third number: cylinder bore, forth number: year of manufacture. If the manufacturing label is missing, the body number can be found on the side of the engine block and/or under the front bonnet along the top edge next to the fuel tank. 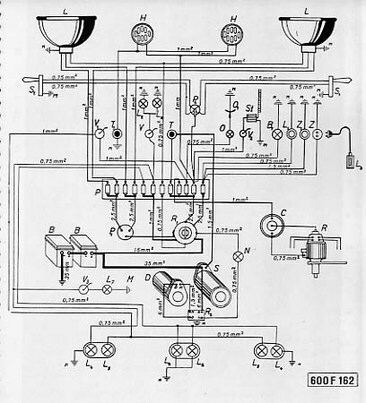 Carburettors: downdraught Zenith IMF / Solex 32 UBIP, 2 no. The petrol engine has aluminium cylinder heads and hemispherical combustion chambers. 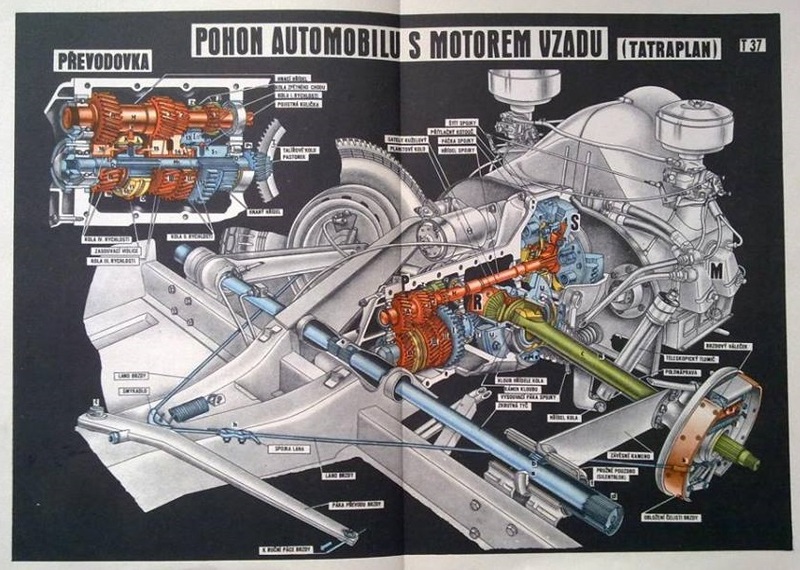 Valves are not inclined as much as in the Tatra T87 and are actuated by crossed rockers and operated by aluminium push-rods from a single camshaft placed in the aluminium crankcase below the crankshaft. The crankcase is split in the plane of the crankshaft. Both halves in which the main bearings are mounted are bolted together. The camshaft is driven from the front end of the crankshaft through gear pinions and the ignition distributor through worm gears. The distributor shaft incorporates a fuel pump drive cam. The lubricating oil pump is driven by the front end of the camshaft, the supply of oil being stored in the finned crankcase. Oil is forced from the pump through the oil cooler mounted in the front part of the car and, through a multi-edge cleaner to the lubricated parts. By-pass pressure valves are provided at the cooler and cleaner. 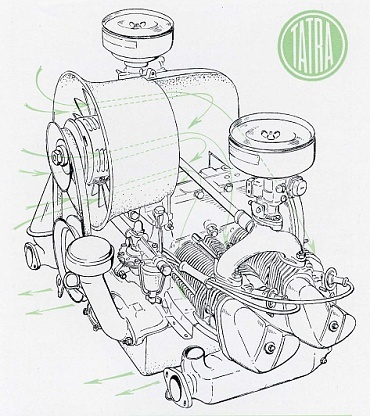 The short-stroke engine develops 26 bhp per litre which is the same specific output as that of the Tatra T87 (8 cyl, 2,958 cc, 75 bhp). Originally the engine had an axial fan with a vertical shaft driven by a bevel gear. 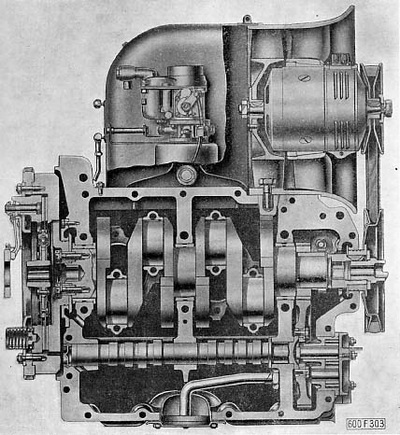 On the later design a horizontal axis fan was mounted directly to the dynamo shaft driven by a V belt. The long manifold piping of the original design was eliminated by using two carburettors and performance increased to 52 bhp. Gearbox oil: 3.5 litres, mineral oil SAE 90 or similar only. 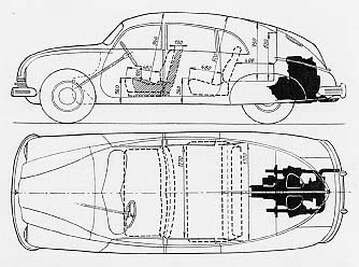 Body: streamlined fully self-supporting steel monocoque, smooth underside with welded-in backbone member; export units had rear fender skirts/spats made in aluminium. Hence the importance of smooth underside in streamlined car body designs. combinations of body with roof and bonnets: ivory and light brown, ivory and dark red, metallic silver and navy blue, metallic silver and dark red, light blue and dark metallic blue. Interior cloth colours: light red, light grey-brown, light green, red, green, blue, grey-brown. Interior leather colours for export only: beige, brown, red, green. In some units seats had a combination of leather and cloth. In the latter series the chrome work and wheel hubs were supplied by the factory with red paint highlighted 'Tatraplan' signs and painted grooves on bumpers. The internal glazed panel size in the rear bulkhead and the lift-able panel above the rear seat increased when the rounded rear lids with larger window openings were installed to improve the rear view. It is recommend to fix another low positioned rear view mirror onto the centre of dashboard to gain a long-distance rear view from the driver's position. white face, grey figures with black outlines etched on flat glass, by VDO / Křižík (K), Autopal (AP), PAL, or Technometra (T) (1948–51, approx. 4000 units), fuel and oil temperature gauges by PAL or VDO, white face, flat glass. white face, brown centre, brown figures printed on metal face, convex glass, by Autopal (AP) or Technometra (T), Praha (1951–52, approx. 2340 units, used in the last Kopřivnice series and Škoda production), fuel and oil temperature gauges by Technometra, white face, brown centre, convex glass. Tyre size: 6,00"R – 16", radial, front: 1.5 Atm, rear: 1.8 Atm. Rim size: E 4,00" – 16"
Interior heating: warm air from the engine in double floor channels exiting in grilles under the front seats. The pipework from the engine compartment to the double floor channels is shown shaded. The front boot has space for two spare wheels – the extra weight improves front to rear weight ratio. Front to rear weight ratio: 44% to 56% (empty), 42.8% to 57.2% (with full load of 405kg). 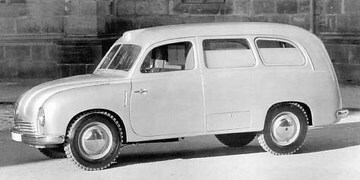 1949 Tatra T201 ambulance (Sodomka/Karosa body), later series front engine, 1 unit (1949 original body damaged and in an accident and then reconstructed with varied details in 1950), front engine on central tubular chassis driving rear wheels. 1949 Tatra T201 'Dakota' pick-up prototype with first series front engine on central tubular chassis driving rear wheels, 1 unit. Used as a service vehicle to accompany Tatra rally teams. 1949 Special Tatraplan T201 front engine prototype van body in the Tatra factory workshop, designed by Josef Klejch at Karosa, Vysoké Mýto. 1 unit, it survives in the Czech Republic. Another unit possibly made and later converted to a police vehicle in 'Šťastnou cestu' film (1962), tbc. 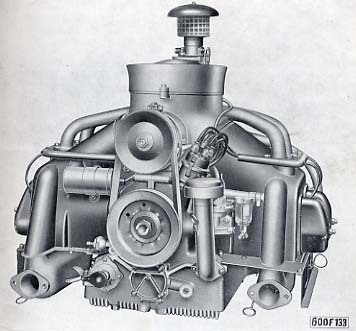 1949–53 Tatra T600D Tatraplan Diesel, with two types of diesel engine, 2 – 3 units? 1949 Tatra T601 Tatraplan Monte Carlo Coupé, 1 unit, in various aluminium body versions, various engines installed, the latest version with a T603 A 2545cc engine. 1949 Tatraplan Cabriolet, Sodomka body, 1 unit. 1949 Tatra T602 Tatraplan Sport, 2 units. 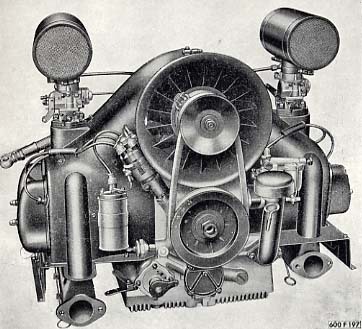 Factory prepared racing Tatraplans, usually painted yellow or grey, had sealed rear doors without handles to lighten and stiffen the car and engines with increased compression ratio 6.8:1 with two dual Solex 30 AAIP carburettors, new 260 degrees camshaft, valves and rocker arms resulting in increased power to 67bhp, otherwise the cars retained normal serially produced specification. 1948 Jeseníky, Czechoslovakia: gold medal, driver: Alois Kopečný. 1949 Jeseníky, Czechoslovakia: first, third and fourth places, winning drivers: Josef Chovanec / Antonín Kubíček. 1949 Velká Jihočeská soutěž, Czechoslovakia: first place in both sections, winning drivers: Adolf Veřmiřovský and Bruno Sojka. 1949 Tatranská automobilová a motocyklová soutěž, Starý Smokovec, Czechoslovakia: first in 2000cc category: winning drivers in light brown Tatraplans: Josef Chovanec / Jaroslav Pavelka, Adolf Veřmiřovský / Augustin Jeřábek, Alois Kopečný / Antonín Kubíček. 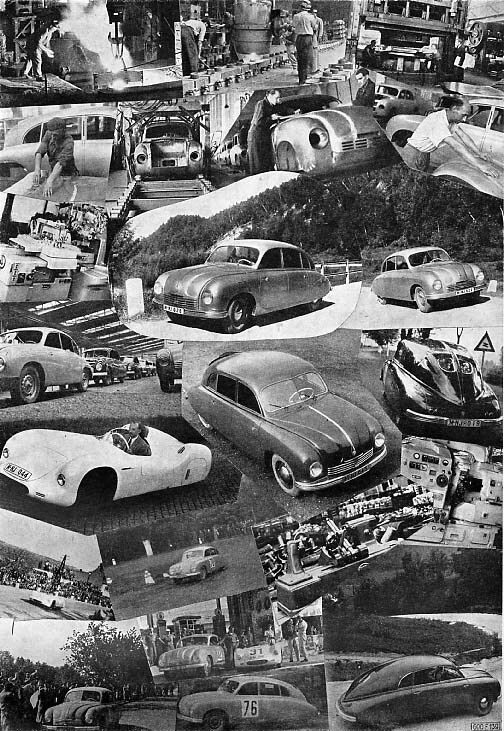 1949 Internationale Österreichische Alpenfahrt: 1056 km, first four places gained in yellow Tatraplans; out of 22 cars in 2000 cc Touring car class, drivers team: 117: Karel Vrdlovec / Vladimír Formánek (Alpine Cup winner), 114: Jaroslav Pavelka / Josef Chovanec, 115: Adolf Veřmiřovský / Ing Schedivý, 116: Alois Kopečný / Antonín Kubíček, team manager Josef Veřmiřovský. 1950 Rallye Interlaken: third and fourth places, Kopečný / Kubíček, Pavelka / Zahradníček. 1951 Internationale Österreichische Alpenfahrt: 1375 km, first in Touring car class: Alois Kopečný / Jan Kubíček, (Alpine Cup winner). 1951 Langa-Langa Gilgil, Nairobi: winner of its class, equal time to the fastest. 10/06/1951 80 km race, Bosque de Chapultepec in Mexico City: first place, 42m 41s, 112.341 km/h, driver: Jean Trévoux. 1953 Coronation Safari: Kenya, Uganda & Tanganyika: first in class C, drivers: Vic R. Preston Sr and D. P. Marwaha.